HIAS, the Hebrew Immigrant Aid Society, is America's oldest international migration and refugee resettlement agency. Dedicated to assisting persecuted and oppressed people worldwide and delivering them to countries of safe haven, HIAS has rescued more than 4.5 million people since 1881. Growing from organizations founded in the 1870s and 1880s to assist Jewish migrants arriving in America, HIAS is responsible for the rescue and resettlement into the United States of noted academics, artists, athletes, entertainers, scientists, mayors, governors, and members of United States Congress, as well as everyday people. Its operational goals are based on Jewish religious teachings. From Wikipedia. 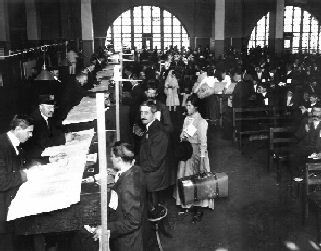 photo: Immigration inspection at Ellis Island. Courtesy of the U.S. National Park Service.